Youths sitting in the shade of a bush next to a shallow water hole possibly dug in a stream bed for use during the dry season, at an unknown location, but probably in Lou country. 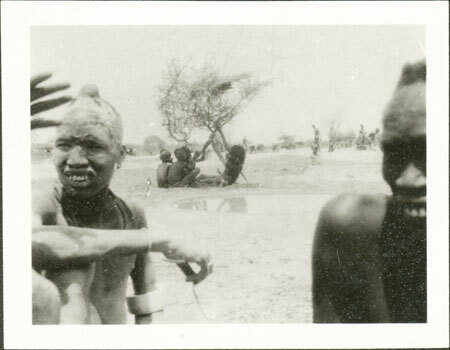 The youth leaning in the foreground has his hair dressed with ashes and bears the forehead scarification lines of initiation, which would make him probably over the age of sixteen. Note on print reverse ms pencil - "4 155 "
Morton, Chris. "Nuer youths at water hole" Southern Sudan Project (in development). 03 Jan. 2006. Pitt Rivers Museum. <http://southernsudan.prm.ox.ac.uk/details/1998.346.155.2/>.